The story of Treasure Island was also destined to be recaptured in the form of a 5 reel online slot game, so here it is. Meet Long John Silver and steel the treasure and sail to freedom as you spin the reels on this gaudy adventure. Match parrots, pirates, and Treasure Island Wilds symbols to steal the bounty from the islanders grasps and become the greatest seafarer of them all. Quickspin is a relatively new development company, breaking through the competitive online gambling industry in the UK in 2013. This fresh-faced company has described itself as having “a burning passion for gaming and a love of gambling” with the goal of “creating the world’s most awesome video slots”. This energetic enthusiasm is just what you want from your gaming developer as they continue to provide online slot games with superb graphics and innovative game play. Get ready for an adventure with pirates and buccaneers as you quest to find buried gold. Based on the classic adventure novel by Robert Louis Stevenson, Treasure Island is a paradise that lives up to its name, and that’s just what you can expect from this online slot. Treasure Island has 5 reels and 40 paylines. Bets can start at 50p up to £100 per spin. You start your adventure on the famous Hispaniola just as she approaches Treasure Island. Unfortunately, it’s your job to round up the crew who have a reputation for ruthlessness. The reels are decorated with cartoon versions of all the central characters from the novel, including Jim Hawkins, Captain Flint, and even Long John Silver himself. You’ve also got a beautiful pirate-lady to keep you company. The playing card symbols on the reels are set in a treasure map and the reels are positioned in a lovely tropical bay background. You’ve also got a jaunty pirate theme soundtrack, and each win is celebrated with canon fire and water splashing animations. There are also some impressive bonus features in this game which will entice any treasure hunter for a spin. For your Wild symbols, you have the Treasure Chest symbols, they will substitute for all other symbols at any time to help you create winning lines. 3 Scatter Compasses symbols on the reels will trigger a pick-me bonus where you have to choose a symbol to reveal either a coin win prize, free spins of the Treasure Hunt Bonus. During the Treasure Hunt Bonus, you will be asked to pick 1 of 5 X symbols on the map, once you have made your choice it’s time to start digging! Reveal a treasure chest which has the potential for a big prize in it. You’ll also want to look out for the Pirate Attack feature which is triggered when 2 or more Barrel Wilds appear anywhere on the reels. A pirate ship will sail into view firing 2 or 3 cannon balls onto your reels. Wherever they land will be turned into Wilds, and if it lands on a Barrel Wild it will explode creating even more Wilds! There is also the Island Hop Bonus in which you’ll get the chance to click on a map of Treasure Island to reveal a variety of prizes such as Coin Wins, Free Spins, Extra Wilds, Super Wilds and Locking Barrel Explosions. 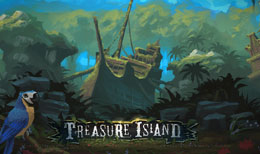 Treasure Island is a classic adventure novel for a reason, and this online slot game by Quickspin lives up to its name. It’s so packed full of action and adventure, that it will become a firm favourite and you’ll always come back for more.